The new 2019 model Hero HF Deluxe is affordable, efficient and impressive. Offering electric start and alloy wheels as options, the Hero HF Deluxe is powered by an air-cooled 97.2 cc four-stroke single-cylinder OHC engine producing 8.2bhp of power at 8000rpm and 8.05Nm of torque at 5.00rpm. The engine is mated to a 4-speed gearbox, along with giving a fuel efficiency of 82kmpl. There are two variants and five colours. Prices start at Rs 39,000 for the variant with kick start and spoked rims and Rs 48,000 for the variant with self-start, linked brakes, and alloy wheels. 2019 HERO HF DELUXE available in BLUE and BLACK dual tone colour (Black with Blue). Check out the photo of all new 2019 Hero HF Deluxe in Black With Blue colour below. Provide your details so that we can arrange Hero HF Deluxe for test drive at your city! 2019 HERO HF DELUXE available in PURPLE and BLACK dual tone colour (Black with Purple). 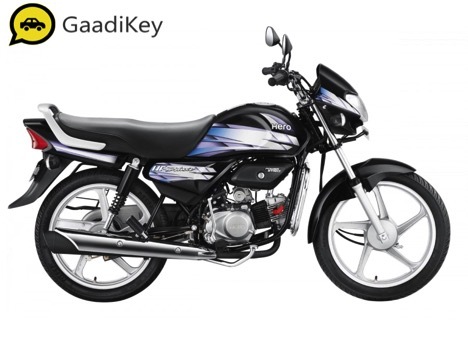 Check out the photo of all new 2019 Hero HF Deluxe in Black With Purple colour below. 2019 HERO HF DELUXE available in RED and BLACK dual tone colour (Black with RED). Check out the photo of all new 2019 Hero HF Deluxe in Black With Red colour below. 2019 HERO HF DELUXE available in RED colour (Candy Blazing Red). Check out the photo of all new 2019 Hero HF Deluxe in Candy Blazing Red colour below.